Our story is not really that different from every other in debt family story that you’ve heard. As a married couple, we didn’t manage our money well at all. We grew up with parents who had a scarcity mindset. Grew up believing that living on a budget meant you were poor and your spending was limited. We always wanted more money in our lives, but couldn’t figure out why we never had any. Looking back it’s pretty obvious to see why we struggled for so long. We had no plan for our money, we had credit cards for every single store we frequented and whenever we put money into savings, we just took it right back out. There was never a time that our bills required us to live paycheck to paycheck. It was simply our poor lack of planning and discipline that got us into our major money struggles. When my husband Tom and I first got married, we had managed to pay off our biggest credit card debt, my car payment, and my engagement ring. I would love to tell you that there was some big, noble story behind it, but in reality, I was able to pay off these debts with a check I received after my father passed away. I’m thankful I made this choice because I was carrying around a much larger car payment than I should have had at my age and it was nice to go into our marriage with a little less debt. If only we would have kept it that way! 3 Home Depot –yeah…3 Home Depot cards…why? We would pay off a credit card and then charge it up again. It was the perfect definition of a vicious cycle. But our credit scores were looking good, and to us, that was really all that mattered. Check out your credit score here. We stayed in this process for far too long and felt shocked when we never actually got anywhere. Even though we were able to make our payments and continuously pay off our debts, we didn’t plan well for those big emergencies that life can hand you. When we found ourselves facing one of life’s biggest emergencies we became very aware of just how dangerous this never-ending debt game really was. As I said, we had become such pros at creating and paying off debt that our savings really didn’t happen at all. Then a few years ago we were hit with back to back financial problems including our son winding up in the hospital. You might know the story about our big downsize and why we did it, but there are a lot of things that have gone untold. One thing I know for sure is that we would have better navigated all of these tough times if we had taken the time to build up savings rather than build up debt upon debt. Before starting your Debt Snowball, Dave Ramsey recommends getting a $1,000 emergency fund in place. Beyond that, the best way to save is with a savings account that pays you interest. High Yield Savings – Earn 1.55% interest with more freedom to make transfers and withdrawals. Money Market Savings – Earn 1.85% interest with less allowable transactions. When it came to paying money toward debt without having any savings to speak of, we had finally had enough. When we downsized our house we were also determined to downsize debt and completely change the way we had always thought about money. After hearing about Dave Ramsey’s Debt Snowball method (that we had thought was impossible to do) we finally started paying off the $20,000 of debt we had remaining. In previous years we thought finding an additional $200 per month to put toward debt was just absolutely impossible. Because of our smaller mortgage payment, we no longer had excuses. 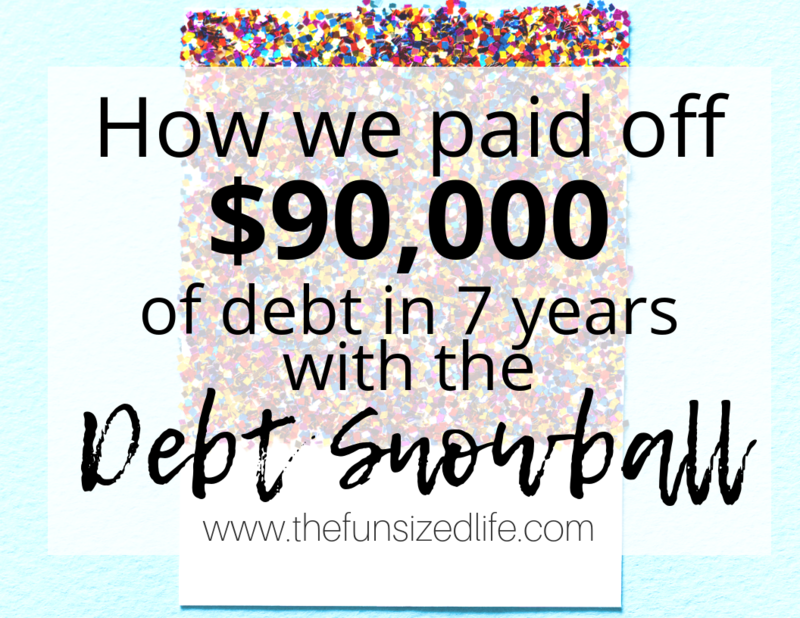 With an additional $200 per month, we stuck to our Debt Snowball for 6 months and were able to pay off over $6,000! After we finished off our car, student loans, and hospital bills, we took a break from the Debt Snowball. I wish we wouldn’t have. About a year later we went back into full-on debt payoff mode with the Debt Snowball again. This time, we were determined to put as much money as we could toward paying off our debt. Now it seemed that $200 just wasn’t nearly enough. This is the kind of intensity you need if you really want to be done with debt for good. Some months were so successful, we were able to make over $1,200 toward debt payoff in just one week! On top of paying off all of these bills, we have continued to pay cash for every emergency that has come our way. Vet bills, car repairs, new utilities for the house, you name it, we paid for it in cash. For the first time in our lives, we didn’t go into panic mode when we were presented with a financial problem and it felt amazing. These unexpected setbacks naturally slowed down our debt payoff but we still managed to pay more than $200 per month to keep the snowball rolling. One other thing that was really helpful in getting our debt payoff sooner was taking out a loan to pay off our biggest credit card. When we first got intentional about paying off our debt, it was very distressing to never really see our biggest credit card debt total go down. Even though we were making $300 per month payments, the amount we owed seemed to barely get a dent in it. We really shouldn’t have been surprised considering there was a 25% interest rate on this particular credit card. When I actually took the time to pay attention to our total and our interest, I was hit with the big realization of how big of a pain credit cards really are. Sure, people had told me my whole life that credit cards were bad news, but naturally, I needed to figure it out for myself. Since we were sick of making big payments with no results, we decided to take out a loan with a much lower interest rate in order to finish paying off our credit card. If you find yourself struggling to get anywhere with a credit card that has a large interest rate, I suggest you check the Loan Exchange online for interest rates starting around 16%. You can apply online for free and save yourself big time in interest payments. When we first started our Debt Snowball, we did it on one income while simultaneously paying off every surprise bill that came our way. It was a great strategy, but we weren’t able to put as much as we wanted toward our debt payoff. It was time for some side hustlin’. I started my blog in 2017 with the intention of creating a sustainable income that allowed me to help pay our debts. After that, I had hoped to allow us more financial freedom in order to travel with the kids while we homeschool. After one year of blogging, I was able to more than double my previous part time income. Blogging has been such a help to me and my family, that I truly have a passion for helping others learn to blog as well. If you have ever been curious about the blogging world, take advantage of my 5 free lectures or check out some of my best blogging tips. The day my aunt told me about dog sitting was probably one of the best days of my life. She told me my cousin was dropping her dog off every day with a dog sitter she found on Rover. Rover is a great app that allows dog owners in your area to find you. You can dog walk, dog-sit, or dodrop-ins. The best part is, you get to choose what you do and how much you make! If you want to learn more about how I earn money, how to get bookings, and how to snuggle dogs for money read my full Rover review. Once you are done with your debt payoff, it’s time to build wealth. Dave Ramsey’s Baby Steps say building a savings of 3-6 months worth of income is a smart stepping stone before moving onto building wealth and investing. Don’t tell Dave, but we actually started investing while paying off debt. — If you’ve read my post, The Simple Investment Plan to Turn $50 into $150,000 then you probably know why we just couldn’t help ourselves! It feels so great to no longer owe credit card companies money. Paying cash for things is one of the most freeing things I have ever experienced in my life. Even though I may not have as many “nice” or “fancy” things as I used to, I do know that everything I have are things that I actually own. If you are smack-dab in the middle of your debt payoff, my best advice to you is to just keep on going. Remember why you started, take out a loan to lower interest if necessary and don’t stray from a smart debt payoff strategy! Yeah I wish I wouldn’t have gotten so comfortable with it! I didn’t have any until I met my husband! Haha so I think I should just blame this all on him.